Kenneth Cohorn known by many as Pop or Canuto, answered his heavenly Father when he called him home on the afternoon of February 27, 2019, in Las Cruces, NM at the age of 87. Kenneth was born March 3, 1931 to John F. and Eva Cohorn in Hamlin, Texas. Kenneth is survived by his children, Larry Cohorn (Nita) and Joyce Cohorn, 8 Grandchildren, 15 great grandchildren, 4 great-great grandchildren, long time companion Janice English, and a very large extended family and friends. Preceded in death by his wife Alma Cohorn; parents: John and Eva Cohorn; brothers: Lindsey, Weldon, Wilmer and Earl Ray; sisters: Vera Loftis, Wanda Faye Abernathy, Sis Johnson and Muriel Markle. In 1937 his family left Hamlin and moved to Hatch, NM, where they farmed in the Garfield and the Radium Springs area. In 1948 Kenneth married Alma Johnson. He soon started working construction for Medinger Construction. In 1962, he acquired his contractor’s license and founded Cohorn Construction, working in Las Cruces and the surrounding areas until his retirement in 1994. 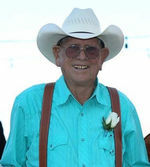 His passion was team roping and was a cowboy to the very end. Kenneth loved his children, grandchildren, great grandchildren, great-great grandchildren, and his extended family. He had five generations living around him on the hill in Dona Ana. He loved to go out to the barn to feed his horse and drive around in his golf cart (to check the 40). Most of all, he loved saddling up Berto to run a few steers with Larry, Lane, or any friend that might stop by. During his rodeo career, he won many prizes, but his greatest treasure was winning the championship belt buckle at the 35th annual Alma Cohorn Memorial/Cowboys for Cancer roping. Kenneth enjoyed life to the fullest by going out with friends to lunch, catching up on the latest gossip at the ropings and of course kissing all the pretty girls. A viewing will take place on Tuesday, March 5th, at Getz Funeral Home from 5 to 7pm. Services will be held on Wednesday, March 6th, at Getz Funeral Home at 10am with burial following at Hillcrest Memorial cemetery. Everyone is invited to join the family at a celebration of his life to be held at Larry and Nita Cohorns’ home after the services. To send flowers to the family of Kenneth Eugene Cohorn, please visit our Heartfelt Sympathies Store.